The issue with this type of thinking is that we get back exactly what we put in. Energy in…energy out. It is a very ordered and balanced system. Little energy in…little results out. Pretty simple formula. This is particularly true when we want to sport those “six pack” abs we admire on others. Truth is, everyone owns those six pack abs only they are hidden deep underneath layers of belly fat. Unfortunately most people will never reveal their abdominal muscles because of the barrage of misinformation and bogus claims that flood their minds daily from any number of commercialize ads they buy into. Let’s explore some of the greatest myths we’ve all heard about concerning abdominal shaping and fat loss. Truth: It’s never about losing weight…it’s always been about losing fat. Truth is, you cannot lose 8-15 pounds of body fat in two weeks. You may be able to lose that much weight but it won’t be all body fat…it will be a mixture of body fat, muscle, and a whole lot of water. These are not the results you are looking for. What is needed is a program that has you focused on losing just the fat while retaining precious muscle tissue because this is the core of your fat burning machine. Myth #2: With the right “ab cruncher” I’ll be able to carve out those “six pack” abs I dream about. Truth: No gadget including the latest one being thrown in your face by commercials is going to magically rid you of fat. Do you honestly believe you can achieve that same sculpted look that others in the gym sport just by using some simple gadget that you saw advertised? If you do believe that…you are exactly the person that these info-commercials are targeting. Don’t be naive. It’s not going to happen. If there was any truth to it…why would people work hard at the gym with resistance training? These gimmicky “convenience devices” may as well be lazy boy chairs in regards to the results you will receive uncovering your hidden abdominals. Myth #3: Losing belly fat requires doing tons of crunches and sit ups. Truth: It is more about fat loss than building abdominal muscles. The idea of spot reduction is a fantasy. You cannot rid yourself of fat over a muscle by repeatedly exercising that body part alone. The truth is your body decides where to put fat and where to remove it and it is largely determined by genetics. Myth #4: Your genetics are preventing you from getting lean. Truth: Hereditary traits never rule out physical improvement. It is lifestyle not genetics that plays the biggest role in determining how far or lean you become and anything else is just an excuse that’s used by those who have given up on their efforts to slim down. Genetics alone do not dictate actions…you do have the power to decide to choose the right foods and break old bad habits. 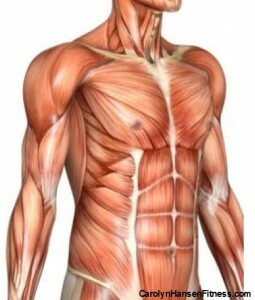 Myth #5: Abdominal muscles are different than regular muscles. Your abdominal muscles are no different than the other muscles in your body and need to be trained just like your biceps or pectorals. Just like any muscle group in order to make strength gains you must overload them by adding more resistance to challenge them. Myth #6: Training your abdominals with a bad back with worsen it. Truth: Ab training is the very thing that supports the back. Strengthen the front of your body and your back will become stronger as well. Myth #7: You must eat a low carbohydrate diet. Truth: You cannot build muscle if your energy is zapped. You must make sure your nutrition plan supports your exercise program. You need to maintain an exercise plan that supports the building of muscle because muscle is what burns fat within your body during workouts and other times as well. Myth #8: Hours of cardio activity strips the fat away. Truth: Cardio activity slows fat burning to cover up that six pack. Only a proper strength training program will do this. It is the only exercise geared toward maintaining existing muscle and building new muscle. If you really want to shift to a lifestyle change that embraces long term fat loss and reveals your “six pack abs” then you will need to adopt a plan for eating and exercising that you can stick with for the rest of your life. This is not a temporary fix of 30 days or a few weeks’ time…it is forever. You cannot achieve this type of permanent lifestyle change without learning to “think” differently. You must shift from focusing on changing your body weight to changing the ratio of muscle to fat in your body. If losing fat really was as easy as consuming fewer calories than you burn, why are nearly three-quarters of all Americans overweight or obese? What if there was another way to approach the whole weight loss/fat loss effort and eliminate the cycling aspect? There is, “Rebound Free Weight-loss” is my comprehensive program created to get you out of the weight loss/weight gain cycle once and for all.